Die Reihe was a German-language music journal, edited by Herbert Eimert and Karlheinz Stockhausen between 1955 and 1962. An English edition was published, under the original German title, between 1957 and 1968. Contributors included György Ligeti, Mauricio Kagel, John Cage, Pierre Boulez, and others. Reviews: Dika Newlin (of 1st DE issue, Notes, 1956), Dika Newlin (of 1st EN issue, Notes, 1958), Dika Newlin (of 2nd EN issue, Notes, 1959), Dika Newlin (of 3rd EN issue, Notes, 1960), George Perle (of 3rd EN issue, J Music Theory, 1960), Dika Newlin (of 5th EN issue, Notes, 1962). Commentary: John Backus, “Die Reihe—A Scientific Evaluation” (Perspectives of New Music, 1962). Publisher Theodore Presser, Bryn Mawr, PA, with Universal Edition, London, 1957-68. 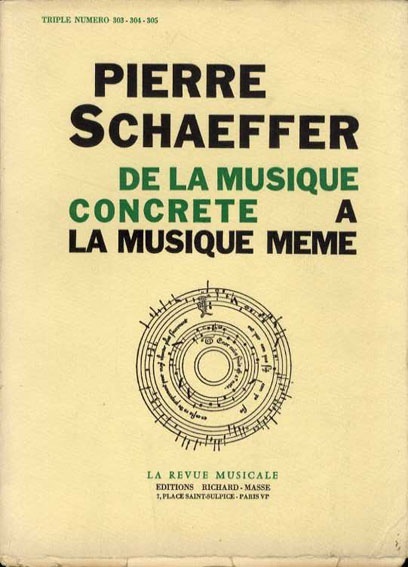 Collection of Pierre Schaeffer‘s writings from 1938-1977 published as triple issue of La Revue musicale (303-305). “Under the impression of today’s global crisis and the rise of ecological thinking, confronted with smart, ubiquitous technosystems and the impression of interconnectedness, there appears a new urge to excavate the remnants of the past. The articles of this issue suggest that in order to understand present technologies, we need to account the systems thinking that fostered their emergence, and that we cannot gain insight into the afterlives of systems without exploring their technologies. With contributions by Etienne Benson, Rafico Ruiz, Katja Rothe, Niklas Schrape, Christoph Neubert and Serjoscha Wiemer, Sebastian Vehlken, Bruce Clarke, Jan Mueggenburg, and You Nakai.